Physical appearance is really important these days in which hair plays an important role. Hair loss affects an individual’s psychological being therefore, treating it is crucial. Recently, surgical hair restoration procedures such as FUE hair transplant have become very popular. At Sheffield you will find many clinics offering FUE hair transplant and other hair loss treatments. FUE is a hair restoration technique in which follicular units are extracted individually one by one from the patient’s donor area. It is no stitch and no incision technique where scar is almost invisible. The recovery is fast with minimal pain in which no sensory loss is noted in the donor area after the procedure. If someone has insufficient donor hair at the back of the scalp, a doctor can collect hair from other parts of the body such as arms, legs, back or chest. In this procedure the follicular units are extracted individually from the donor area and inserted into the recipient area. In FUE hair transplant, the procedure is performed under local anaesthesia. The surgeon then begins by extracting follicular units out of the donor area. Till the time the recipient area is prepared, these grafts are kept in a holding solution. Finally, the implantation of these extracted follicles is done as per consultation with the patient. FUE hair transplant is not a non-surgical procedure; therefore if someone wants to opt for other treatment simultaneously with this one then he/she should consult the physician. FUE hair transplant provides a natural-looking result and is suitable for men who are suffering from severe hair loss problem. Hair loss has become a common issue that women face today and FUE hair transplant is an effective procedure suitable for women suffering from acute hair loss problems. Follicular Unit Extraction or FUE is a minimally invasive surgical procedure that requires no stitching or scarring. 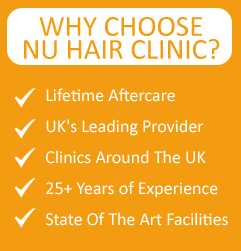 At Sheffield, Nu Hair Clinic is one of the leading clinics that provide FUE hair transplant and other hair loss treatments. You can get free consultation with surgeon as well as coordinator to get an idea about the treatment and how it can work best for you.